We know it will. Rain that is - especially here on the wetcoast, which is probably why we fell in love with these hats. Made locally in Vancouver by a brilliant mompreneur, our new kids' rain hat not only looks fabulous but puts to rest the seemingly endless hood struggle. Think about it. How often have you chased your kids around the playground saying (shouting?) 'put up your hood'? How hard is it to see sideways with a hood on? And doesn't it seem like your hearing takes a little nose dive with a hood up? Then there's the times when they look up at you with drops of rain hanging from their eyelashes and little button noses, even when they're dutifully wearing their hoods. This wide brim hat actually keeps rain off the face and the velcro chin strap keeps it firmly on. Made of 100% cotton fabric coated with waterproof polyurethane and lined with super soft organic cotton with bamboo, it's easy to wipe clean or, if necessary, hand wash in cold. 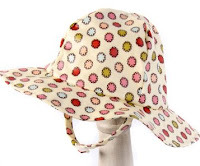 The hat comes in four fun and colourful patterns: flower power, spring bloom, paisley and boy blue and in sizes fitting 12 months up to 6 years. Trust us, this one's a winner. Once your child wears it once, she won't want to leave the house again without it, even if it's not raining. 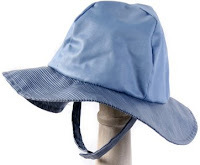 The kids' rain hat is available at Lavish & Lime. 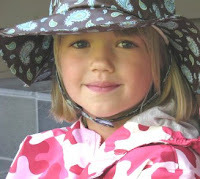 WIN WIN WIN a Paisley blue/brown rain hat for your little puddle jumper. To enter, simply leave a comment on this post before midnight PST November 1.